Your diamond is one of your most important possessions. You want to protect it from loss or theft, but there is a problem. Distinguishing your stone from others of similar size and quality has been nearly impossible. GS Labs utilizes leading edge laser technology. 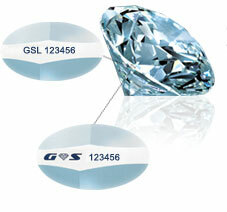 Using lasers, GS Labs can inscribe your diamond with a unique name, serial number, logo or personal dedication. Each inscription is hidden to the naked eye, but is clearly visible when viewed through magnification. GS Labs uses the world’s most advanced laser inscription technology. To create your inscription, a tiny, high energy laser beam carefully marks the diamond around the perimeter. You may choose to add a name, identification number, personal phrase, or appraisal number. Once inscribed, your stone will carry an indelible mark of authenticity and ownership. Laser inscription won’t affect the clarity, luster, or value of your stone, and you’ll have the assurance that your diamond will forever be known as yours. Laser inscription establishes your diamond as a one-of-a-kind stone easily distinguishable from all others. You’ll have the prestige of owning a unique gem and the security of knowing that through our confidential database, it can be readily identifiable if lost or stolen. All stones laser inscribed by GS Labs are registered in the Diamond Laser Registry. The registry provides a permanent record which confirms the stone’s authenticity, identity and ownership in the event of loss or theft. Moreover, if the diamond is a gift, you can dedicate it with a personal inscription that will last forever.